When knee pain strikes, exercise may be the last thing you want to do. However, whether your knee pain is caused by an injury or inflammation, exercise will usually provide some relief from your pain and may keep it from getting worse. By keeping leg muscles strong and your weight down while maintaining bone strength and lifting your mood, low-impact exercise works in conjunction with your treatment program for overall improved health. Check with your doctor to plan the best exercise program for your condition. Whether you swim, jog or do an aqua aerobics class, working out in the water provides the perfect environment for safe, low-impact aerobic exercise that won't jar your knees. 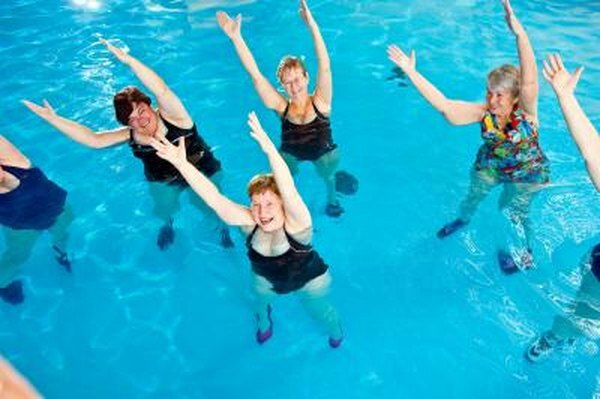 The Arthritis Foundation recommends exercising in warm water that is between 83 and 88 degrees Fahrenheit to increase circulation while you are getting your cardiovascular endurance workout. The water provides buoyancy to create the added benefit of resistance to your workout, increasing your muscle strength and making your time in the water efficient. Walking provides a low-impact, well-balanced workout for almost any fitness level. Walking burns much fewer calories than jogging or running, so to increase your intensity, try swiveling your hips to create a longer stride. Keep toes pointed forward and increase your speed by swinging your arms. Walking helps to improve cardiovascular health and increases your stamina, making other tasks easier to perform throughout your day. Riding a bike is a low-impact, non-jarring way to train for cardiovascular endurance while strengthening your leg muscles. Opinions differ on whether cycling is a good choice with problematic knees, due to the repetitive nature of the activity. For example, Merck Manual's Online Medical Library suggests bicycling may be harmful for you if you suffer from certain knee disorders. If you decide to try cycling, start with a resistance comfortable at a rotation of 60 per minute. Increase to 90 rotations per minute as your fitness level improves and ensure you are properly fitted to your bike. Stop cycling if your knee pain worsens. The National Institute of Arthritis and Musculoskeletal and Skin Diseases states that the best exercise routine if you experience knee problems should include three elements: range-of-motion exercises where your joints are moved through their complete natural range of movement, strengthening exercises to increase muscle strength and support sore knee joints and aerobic exercises to control weight and improve heart function. Look for ways to incorporate all three aspects into your exercise regimen for your best chance at staying healthy and pain-free. Always talk to your doctor before beginning a new exercise plan.